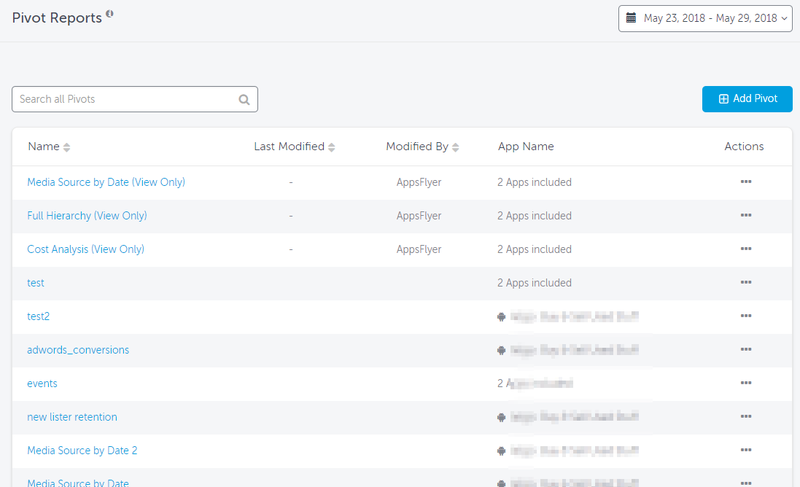 What is AppsFlyer's Pivot Table? 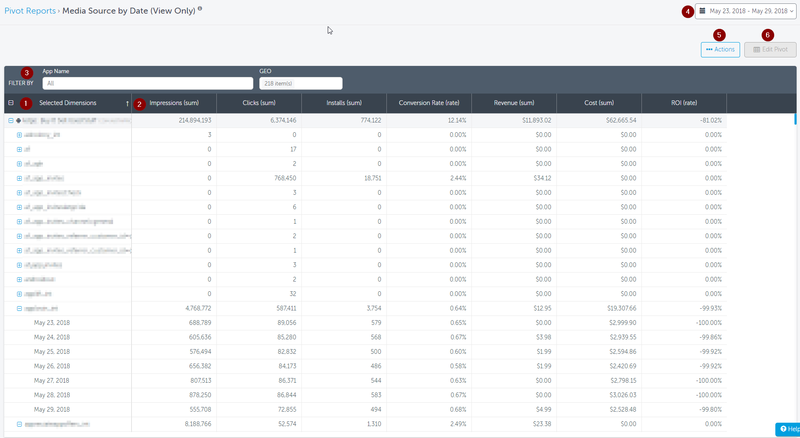 The Pivot table, an AppsFlyer premium feature, provides marketers with unparalleled deep analysis capabilities, speed and ease of use in a familiar format - without the need to download data or rebuild custom pivot tables. With Pivot, marketers can answer their complicated questions right from the AppsFlyer dashboard, collaborate with colleagues and improve their agility, adapting to new and emerging opportunities faster and more easily. Pivot saves you time and is incredibly simple to use. Pivot consists of an intuitive drag-and-drop mechanism for selecting the data you want to view. Pivot comes with a number of pre-defined reports, together with the ability to very easily create your own customized reports. The information displayed in the Pivot is based on the information found in the Master API, and is therefore calculated on a daily basis. For more information on the Master API, click here. 1. From the dashboard menu, select Pivot. This page contains all the pivot reports created by you and your team. 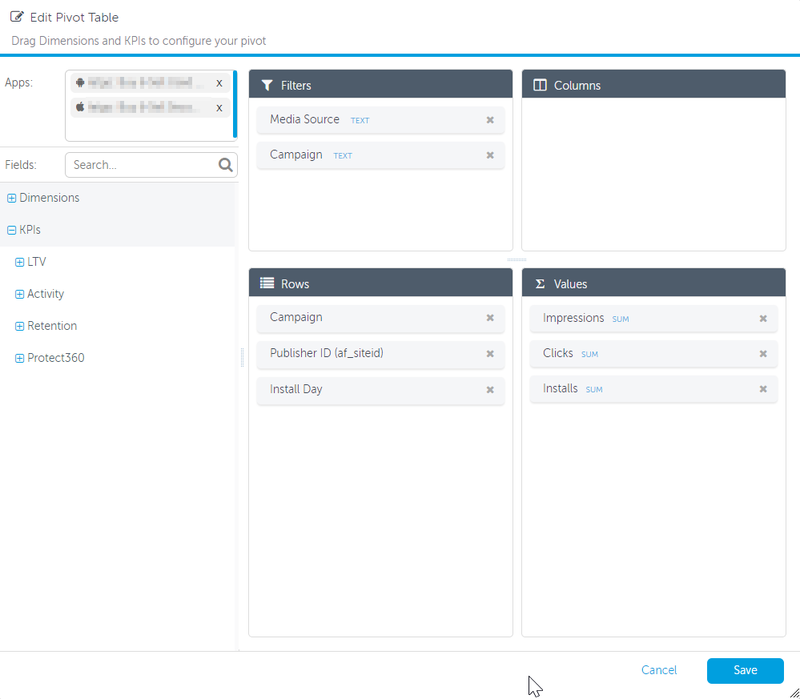 It also has as 3 useful pre-defined pivot reports created by AppsFlyer, to help you get started: Media Source by Date, Full Hierarchy and Cost Analysis. These reports are view only and cannot be altered. However, they can be duplicated to create different reports. View History log See who handled the report's structure, what was done and when. 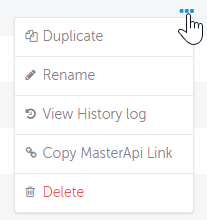 Copy Master API Link Pull the pivot report's data directly from AppsFlyer's servers into your systems, using its corresponding Master API URL. Note that only the account owner is able to get the full link. Team members get the link without the API token. Columns can be arranged in ascending or descending order by clicking the column title. You can also amend the width of each column. In the Pivot Reports Page you can also add new pivot reports or click on existing ones to edit. 3. Enter the name of the new Pivot report to be created. 4. Click Submit to open the edit section of the create and edit Pivot process. 1. The following window opens and already contains the name of the new Pivot given by you in the previous window. Click Edit Pivot. 2. The Edit Pivot Table window opens. 3. From the left pane of the window expand the Dimensions option. The dimensions are the groupings, which you can use to structure and sort your pivot reports. You can drag and drop the selection to change the order of them in the table. 4. 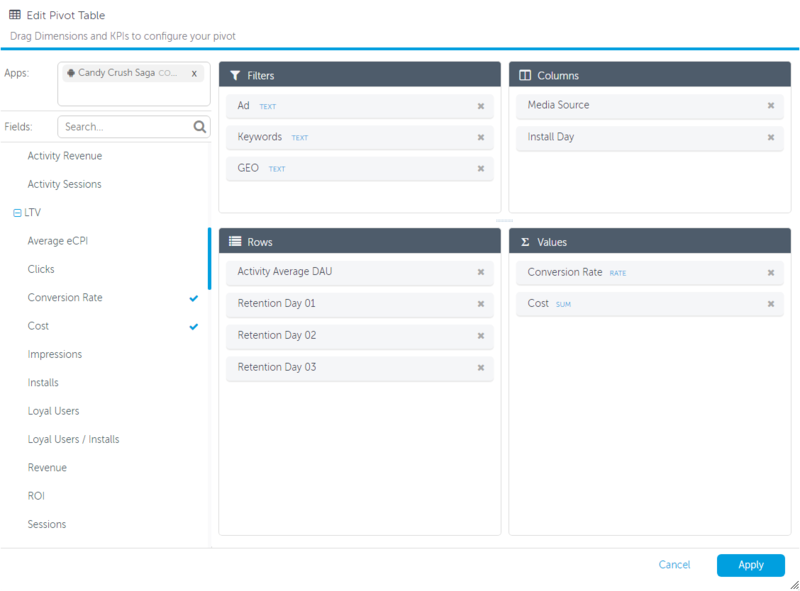 Expand the KPI options and again, drag and drop them into the appropriate section. 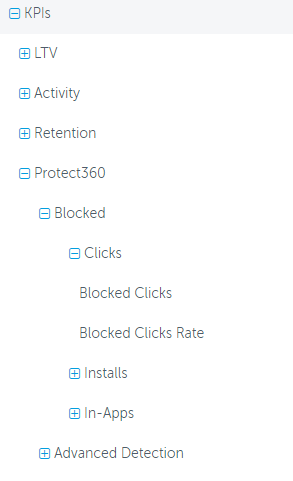 LTV, Activity, Retention and Protect360 (for accounts that have Protect360 enabled). For more information about these KPIs please go here. 6. 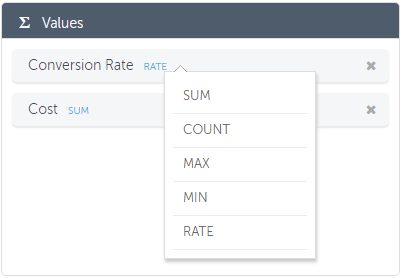 In the Values section you can change the operation for each KPI to either Sum, Count, Max, Min or Rate. 7. Once you have completed your selections, click Apply. Your new Pivot appears in the drop-down menu on the main Pivot page. Select it to open it. If you add too many selections, you may receive a message asking you to reduce the number of selections. The first column holds the dimensions selected for the groupings of the report. The dimensions are grouped according to the order in the pivot edit page. In the example above, the primary dimension is the app name, followed by the media source and concluded by the install date. The rest of the columns are the KPIs selected as Values in the pivot edit page. In the example above, the first KPI is impressions, followed by clicks, installs etc. The filters set for the report in the pivot edit page appear here. 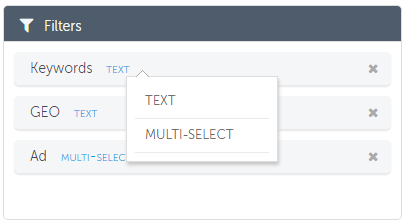 You can type your filtering string or select multiple items with the drop-down boxes. Use the Date Selector to refine your search to specific dates. You can select your own custom date range or use one of the preset date range buttons. You can access the same actions per pivot report as available in the pivot reports list. Click Edit Pivot to open the Edit Pivot window. Timezone support in Pivot depends on app settings and the queried data in Pivot. App timezone is set to timezone X and never changes - pivot displays timezone X. If Pivot only contains data from before the timezone change, Pivot displays timezone X. If Pivot only contains data from after the timezone change, Pivot displays timezone Y. If Pivot contains data from before and after the change, Pivot displays UTC. Timezone for all apps is set to X and never changes - Pivot displays timezone X. If Pivot only contains data from before the timezone change in the app, Pivot displays timezone X. If Pivot contains data from after the timezone change, Pivot displays UTC. In this case there are several different timezones, therefore Pivot defaults to UTC. Currently not supported. Pivot displays USD currency regardless of the currency in App Settings. AppsFlyer is able to present cost data for over 80% of tracked app installs. The data, for most of the big media sources, is retrieved via direct APIs between the networks and AppsFlyer. For some of these networks, the cost data is limited to certain dimensions. Therefore, there are differences in the cost data, that reflect when using the Pivot table(or Master API). If you see missing cost data on the Pivot table please refer to the Supported Dimensions column in this table. If the dimension you use to group your KPIs by is NOT supported by the specific media source, cost data cannot be displayed for it. 1. Snapchat does not provide cost data related to countries. Therefore, cost data for Snapchat is not presented if a table is grouped by the GEO dimension. 2. Inmobi doesn't provide cost data related to the Channel dimension. 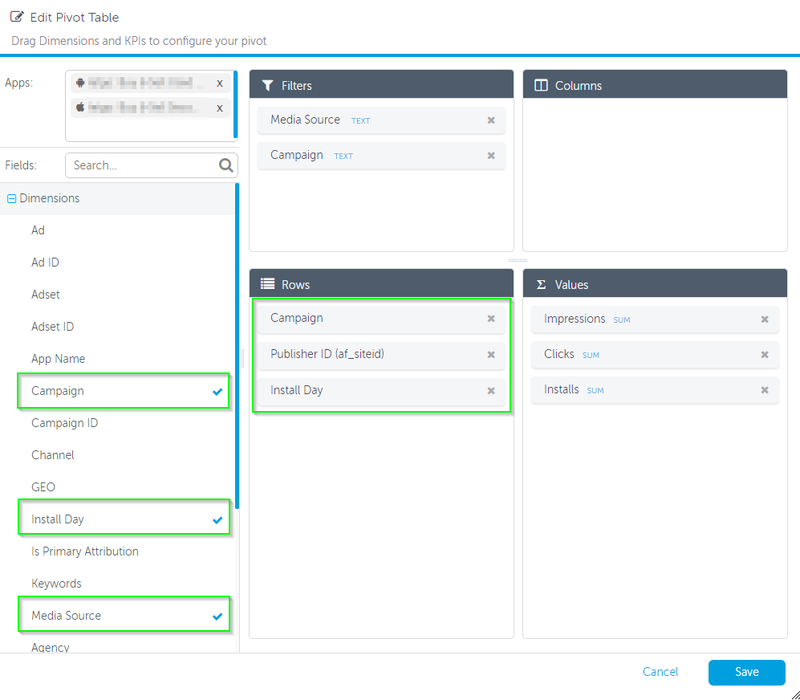 Pivot table includes data from retargeting campaigns i.e. re-engagement campaigns. Retargeting data is included in Activity KPIs (like in-app events and revenue), but specific retargeting KPIs are not available in pivot.